"I'm looking for results from the word go" - Bradley Smith. An exclusive interview with Bradley Smith, who is joining the new factory KTM MotoGP team for 2017. Smith has spent the last six seasons at Tech 3, claiming three podiums in Moto2 before graduating to the MotoGP team in 2013. 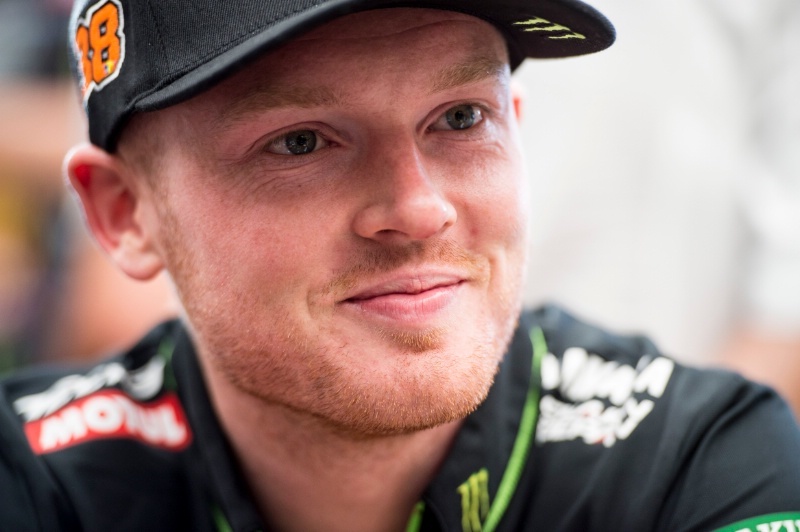 The Englishman's best premier-class result is second in the 2015 Misano round, a year in which he also finished sixth overall and top satellite rider in the world championship. 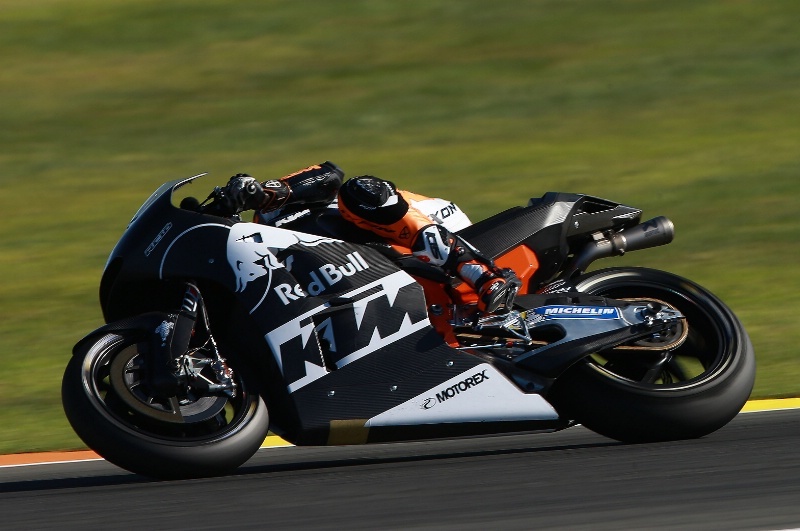 But after improving in each of his previous MotoGP seasons, Smith dropped to 17th place during an injury interrupted 2016 campaign, which coincided with the change from Bridgestone to Michelin tyres and unified ECU software. First things first, Happy birthday for November 28! Thanks a lot, I'm feeling a bit older. 50/50 actually, but I'm also still recovering from my injury so that adds to it a bit. But I'm fine. I'm 26 now. ...and how much of that time have you been racing? I started racing at six-years-old so this is perhaps my 20th year - a long time. Obviously it was more of a weekend hobby at the beginning, with motocross, and I only really turned professional in 2006. After all those years of effort and sacrifice, does it ever feel like 'just a job'? Actually it feels like more of a job now than it ever has because of the expectations that come from riding in a factory team. Everyone in the team expects a certain level of performance and needing to achieve that puts an amount of pressure on your shoulders. It's very much like target setting in a more 'normal' workplace, where there may be a particular aim and if you do better that's great and if you do worse you get a clip around the ear hole! From that point of view it's got more serious, but more importantly you're still doing what you absolutely love doing, every day you're there. I can say that there's nothing else I would rather do and that I'm really lucky. So what are the aspects of the 'job' that you really look forward to? For me at the moment, the biggest thing is the challenge of taking a motorcycle and a team and trying to extract the best result that you possibly can. Working on all the intricate details that make a motorcycle go fast - chassis, suspension, electronics and working with your group of people to get the most you can and then putting all that work on show on the Sunday. It's the fact that the result on Sunday is the end product of so much work by so many people that it means so much. Yeah, absolutely, I really enjoy the technical and developmental side of things. It's fun to work along with the crew chief and engineers to influence my performance in track. It's fascinating to work on the algorithms to make the bike as fast as possible. I absolutely believe that the rider has to know a certain amount about the bike technically to be able to give good information. I've always tried to understand all the systems on the bike on at least a basic level so that I can speak the same language as the guys working on it. Rather than just giving a vague comment which could have four solutions, I try and have a bit more input and try to be more technically precise. I'm hoping that that kind of answer can help to get the number of options down and allow the technicians to find a solution faster. It's partly my love of that aspect of the job that made me so keen when KTM came along with the offer for this year. This kind of technical challenge is right up my street and I've been waiting for this kind of opportunity for some time. It's really exciting to be able to start with what is basically a blank project. 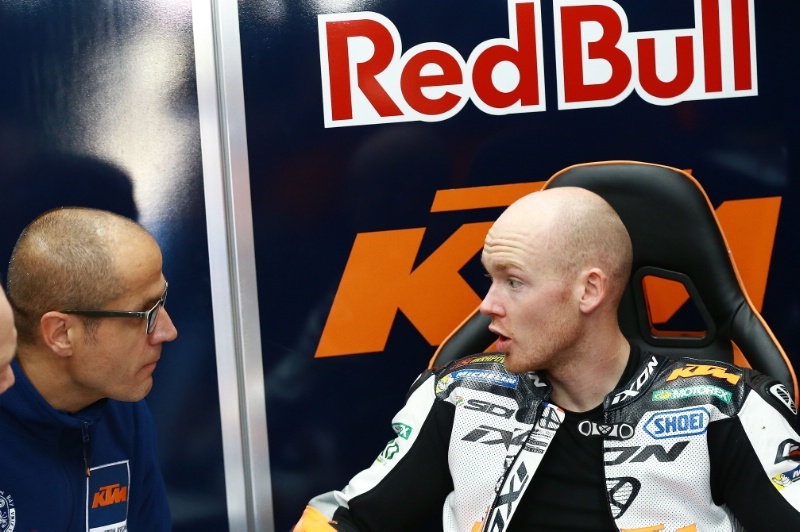 Your contract with KTM is two-years, isn't it? It's two-years, for 2017 and 2018. Is there a feeling that the first year is for development and the second for racing? In a very loose way yes, but that's not my view. From my point of view I'm looking for results from the word go. I don't want to write off 2017 and say that in 2018 we're really going to up our game. I want the bike competitive as soon as possible. Every day we're working on the bike we're getting the best we can. If the bike becomes competitive after six rounds, that's great. But if it starts to move forward in 2018 that's also fine. The sooner we can get there the better so that we can get that positive feeling going. The way I see it, in MotoGP nobody ever stops improving and we've got a huge amount of catching up to do, so the first year is going to be busy. Do you like getting involved in the nitty-gritty of working with the data? Yeah, I'm terrible. I tend to be well in there with the engineers. I tend to get involved in the suspension, chassis and data. I definitely get involved with interpreting the graphs and suggesting strategies from the raw data. I think that often the rider can play a role in helping the data engineers to translate the numbers into useful performance suggestions. To the data engineer it may be just a line on a graph but you need the riders input so that you can translate that line into stuff that can help the feel on track. It's the riders job to teach the data engineers how their lines and graphs relate to the rider's feel on track and if you do that in testing - where there's more time - it makes it a hell of a lot faster at the race track where there's no time to spare. Honestly though, sometimes I get involved a bit too much and it might be best if I get out of my leathers, disappear and let the team do their job. But I think overall I do bring something to the table from that point of view. Coming back to the 2016 season, you're a rider who has had a solid upwards trajectory as you got more experience but last year was different. Did the technical changes hit you particularly hard? Apart from the changes, it was one of those seasons where nothing went right. Starting at Argentina we had the wrong tyres delivered for us on the Sunday, in Austin I went down because I was distracted by Cal's crash and in general we had more technical problems than usual with the bike - problems that I'd never had before. One thing led to another and just as we seemed to be pulling things together mid-season I had the accident which put me out for three races. I think the three years before that had seen an improvement in the right way for two years, and then a picture-perfect year in 2015. Things were going well, so I see 2016 as having three-years bad luck in one. In racing if it doesn't go your way, it just doesn't. It wasn't just one thing, it was lots of things coming together. At least my character has been built by it! Did you think the technical changes affected the satellite Yamahas more than any other bike? I think that the Yamaha is a really well developed bike, which was perhaps more refined around the Bridgestone tyres than other bikes. It was perhaps how well we had the whole package working in 2015 and how perfectly we had all elements working together that caused us to be more affected by the changes. We came from so much of a high with that well-balanced bike, so we tried to use the same bike with the Michelins. I was on such a flow from 2015 with the excellent feeling I had then and when I didn't get that same feeing with the Michelins it may have affected me more than other guys. Perhaps if I hadn't had that excellent feeling in 2015 I would have been more open to getting my head around the bike in 2016, but I was looking for the feeling I'd had the previous year and in the end it just wasn't there. It didn't matter what I did, I just couldn't get it back and that left me a bit down in the dumps. I think what you saw was that in combination with the weird bad luck I was talking about before. Do you think that the team were perhaps too complacent with the bike, given how it had performed in 2015, which meant that not enough resources were put into preparing for 2016? No, I wouldn't say complacent. It was more me looking for that feeling I'd had then and me having to get my head around how the Michelins had to be ridden and at the same time having further problems. I was guiding the team to try and find that sweet spot from last year and it didn't exist. I was trying to find something which didn't exist in the package rather than cracking on with and accepting how the Michelin worked. I really understood the Bridgestones well and a good lap time with the Michelins came in a very different way. How you carried your speed around the corner was very different with the Michelin and you couldn't use the front in the same way and it took me too long to get my head around that. I understand them a lot better now though. Perhaps all that struggle and missing the bullseye this year has put me in a better position for working on the KTM for next season. From that point of view, I'm taking it as a positive. So in terms of factory involvement and putting resources into the project, if you have a line where you have Honda at one end, Aprilia at the other and Suzuki somewhere in the middle, where do you place the KTM effort? Honestly, I would put them at the top with someone like Honda. They've taken this project super seriously. The amount of personnel in the team is large and they've been running a two-rider test team this year and have brought four riders to many of the numerous tests. The fact that they've hired Pol and I and are retaining Mika as a test rider into 2017 shows a strong commitment. I would say that their commitment is well up with the likes of Honda, Yamaha and Ducati. The only problem of course is experience. As a group and team they haven't done a full season in MotoGP, they haven't been to places like Argentina and Austin and that's what's playing against our challenge. When we turn up to a track and know that your rivals may have up to 20-years experience on that track it's pretty daunting. But in terms of commitment and manpower I can't ask for more. Is your side of the garage new to you, or have you brought anyone with you? The team was actually put together by KTM themselves. They've gone with their experience because as a company they've certainly put together some good teams, not only in MotoGP and Moto3 but also in AMA Supercross. So I was happy to go with their suggestion when they said they would put things together. I didn't have a lot of involvement with regard to personnel, but if you look at the credentials of the people there it's amazing how much depth of experience there is and who they've managed to convince to take part. We've got guys who were at Repsol Honda, in winning situations, and guys like that have put things aside to come to us. They've taken that kind of risk and I don't want to let them down now and hope we'll get the results they deserve. It also helps that I've worked with my crew chief [Tom Jojic] before during my Moto2 years at Tech3 in 2011 and 2012 and considering the bike we were on we did well together. How about in terms of numbers of crew involved? We've probably got double the amount of personnel, so if I had six people working with me at Tech 3, I've got twelve here - it's a serious effort. Though I have to say that it comes with positives and negatives, more manpower doesn't always mean better results but it does show intent and gives more attention that can look for those small details that can make all the difference. The size of the team adds pressure to achieve but at this time we need as many hands on deck as possible. It sounds as if you'll also need to sort out communication in the new team environment. If you start with any new team you always have to get used to the new human environment so that pretty much comes with the territory of joining a new team. All riders describe things in different ways so it can take six months or so to come together and feel natural in an environment. The fact that I've worked with my crew chief will help. The team is all English speaking and I like to think that at 26 I've got a little more experience and confidence to guide people around me, so I'm hoping that that six months can be shortened. I'm also guessing that the Red Bull sponsorship will mean that the team is always well funded? Now, having ridden the KTM, does it need more or less development than you expected? I would definitely say it felt more comfortable than I expected. I felt comfortable on the bike straight away in terms of the sitting and handlebar position and also in terms of what you can feel from the bike through your hands, backside and feet. If there's any vagueness in that feedback it can be scary, but the bike talks to you well. I think the good feedback may be from the steel chassis that KTM has decided to use. I was actually very surprised at what they had been able to achieve in just one year. But because the bike was so understandable it was also clear about what needed to be improved - given that I'd just come away from a really well developed Yamaha M1. That comparison has been a really useful yardstick. Overall though I'm really pleased with where we are at the moment. Can you be more specific about the areas that need improving? Honestly I don't think there is one particular area; it's really a matter of refining every area. If there was one area that really stuck out it would actually be easier but it really isn't like that. Why did the team go for WP suspension? KTM HQ actually sits right next to WP and they've had a longstanding relationship and been successful together in other projects. 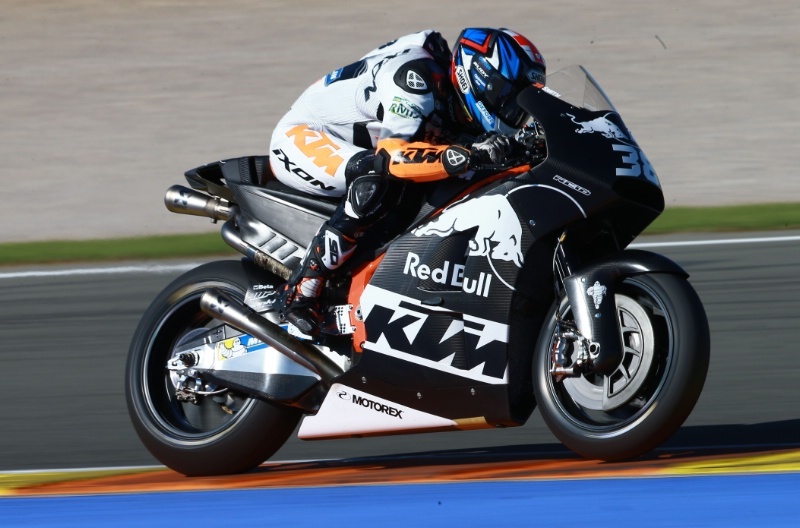 They've won Moto3 together with Brad Binder and also won the last couple of years with Zarco in Moto2 so I think the leap into MotoGP isn't something which is beyond them. One thing is clear with WP though because we're the only team which is using them we've got all their resources for us and they can do all the shock and fork development around our bike. What's available to us is endless so if we need something particular from them we'll get it and we'll always get the latest of everything. With a satellite team we have to make do with what we're given, but with WP we're first in the queue. And you're using Brembo brakes? Does the motor have enough raw power? The first thing I noticed about the motor isn't the power but how different the power characteristics are. In the KTM we're using a V4, so at the moment it's more of a case of getting used to how it delivers what it's got, though it does feel as if it does have plenty of power. It's not really the power where we can make progress but using the power effectively with chassis and electronic adjustments. That's what we're working on at the moment and still haven't quite understood. In terms of top speed we're looking very strong, we just have to work out how to use 250 or 260 bhp. Are you finding the engine note of the screamer engine off-putting? I think I said in an interview after the first day that the engine note was confusing me a little but it's all a question of getting used to it. I'd spent so many years hearing a certain noise and pitch and initially jumping on the bike the sound confused me a bit, but I soon got accustomed to it. It still sometimes surprises me a bit but I'm pretty much there. The engine note can sometimes make you feel as if you're going faster than you really are, but I'm getting my head around that no problems. In the post-season tests you have obviously been mainly developing the bike rather than going for lap times and the times seemed to be about two-seconds off the pace. Could you have gone faster than that if you were going for a lap time? Honestly I'm going to say no just because of the way I work. To get a valid idea I need to be going as fast as I can, you may be keeping just a bit in your back pocket, but the idea is to give the team useful data. Perhaps something which made the times slower is that I never had the same bike over two runs because we were trying and changing so many things. There was always a different aspect of the bike that I was testing and needed to learn but I was always giving it my best. I think that what you saw is the fastest we can go at the moment given the limitations of our testing program. Are there any particular aims or expectations for next season? At the moment it depends more on how the final testing goes and how we help the team and guide them in the right direction. If we look at Mika Kallio, his lap time was 2.6 seconds off Jorge in Valencia and Pol's lap time was maybe just under the 2 seconds behind. So we'll start with a gap of anywhere between 2 and 2.5 seconds with 2 being more of a goal. ...and lastly given the testing pace that Johnny Rea showed at Jerez, do you think that one of the most cost effective ways of getting a faster lap would be to go down to the Kawasaki dealership and buy a ZX10R? Bradley Smith: Erm... probably not! I think it'd be more interesting to go down to the shop that sells Pirellis and get some of those. The cold conditions meant that the Pirellis and Michelins were working at a similar level though I've got to say that what Jonathan was doing on a production-based motorcycle was remarkable. I think that if I invited him to Malaysia in February things might look a little different.